Scandic Triangeln is a former Hilton hotel located in the heart of Malmo, with shopping, entertainment and culture on your doorstep. The hotel is located at the underground Triangeln train station with direct access to Copenhagen Airport. See location in Google maps. The code is valid until 31 March or until all the pre-booked rooms are taken on a first come, first served basis. You just write “Copenhagen Airport” in the From-box and “Malmö Triangeln station” in the To-box (it works with Malmo Triangeln Station without the dots over the o, as well). Leave the underground Triangeln station through the northern exit (“Utgång Norra” in Swedish) and continue approx. 150 m and the entrance to the hotel is on your right side. See the location in Google maps. 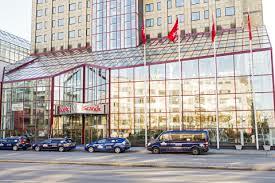 There are parking places available at Scandic Triangeln Hotel. There are several other hotels (Teaterhotellet, STF Malmö City Hotel & Hostel) within walking distance of Scandic Triangeln. The easiest is to search for hotels using hotel booking sites like www.hotels.com or www.trivago.com.